In anticipation of tutoring yet another dressmaking course I decided to re-visit my basic shift dress pattern. I used a Prima pattern that was originally released with the magazine back in April 1997! Since then I have made the pattern up many, many times. Over the years it has seen a variety of sizes from a 14 to a 22 plus lots of variations in styling. So – back to basics. I measured myself (not a happy experience!) and noted on my chart. As I use my upper bust/chest measurement on which to base the pattern I needed to draft my “personal fit” pattern from a size 20 and then do a full bust adjustment. First I used the Nancy Zieman method of pin, pivot and slide. I compared the finished result with the TNT bodice that I have been using of late and there was a huge discrepancy. I then re-drafted using the Palmer Pletsch method of slashing and spreading the pattern and after a deal of “finessing” ended up with a bodice that was not too dissimilar to my TNT bodice. I cut out the front and back using a firm calico, marked the darts etc with carbon paper and a tracing wheel. I stitched with a long stitch using a contrasting thread. I inserted a zip into the centre back using my favourite lapped zip method. Now to try on the toile and check the fit. Interesting! Several tweaks required. I needed to pinch out a small dart at the neckline to remove a little “gaposis”. 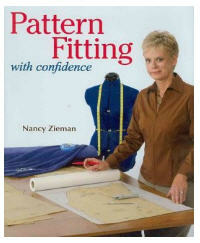 My shoulders are slightly more sloping than the pattern – adjust them by 1/4 inch. They are also narrower, so reduce the width by 1/2 inch. The bust dart needs to be shortened and lowered by ½ inch and the body darts also reduced in height by ½ inch. 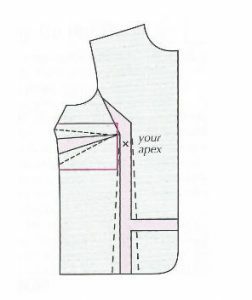 The front armscye needs to be raised by ½ inch and the side seam taken in by ½ inch. The front waistline was way off. 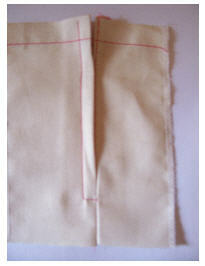 It needs to be lowered by 1 inch at the side seam and 1½ inches at centre front. The back bodice side seams need to be taken in by at least ½ inch and the back armscye cut back by ½ inch. I could put on and remove the dress without opening the back zip so not required. The width of the skirt seems OK. The length of the skirt at 26 inches finished is also fine. I re-drafted the bodice front and back incorporating the changes. In view of the number of alterations I decided to make another toile of the bodice. Using a lighter weight calico I quickly ran up a new bodice and tried it on – success! I attached the new bodice patterns to their corresponding skirt pieces and set aside ready to make the dress in a fashion fabric.